What a week it’s been! With easy access to the whole fishing grounds, QCL anglers last week enjoyed one of the fishiest trips of the season. 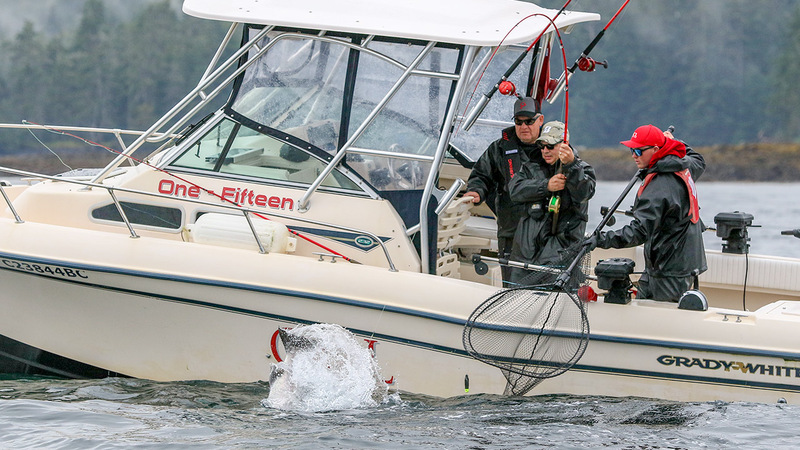 Working the inshore sweet spots from Green Point all the way around to Cape Naden, our guests found their share of chunky Chinooks, many in the 21 to 28 pound class, with lots of high-teeners and enough Tyees to keep it interesting! 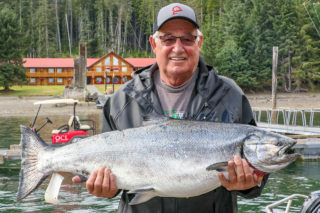 It was certainly a good trip for Saskatchewan angler David S, visiting the Lodge for his 8thtime, when he joined the QCL Tyee Club, boating a beautiful 37-pound Chinook with his guide Mark Kasumovich and fishing buddy John P. Andy S came from Washington state to enjoy some great QCL fishing and was rewarded with a 41 pounder with some help from his guide Tristan O’Brian. 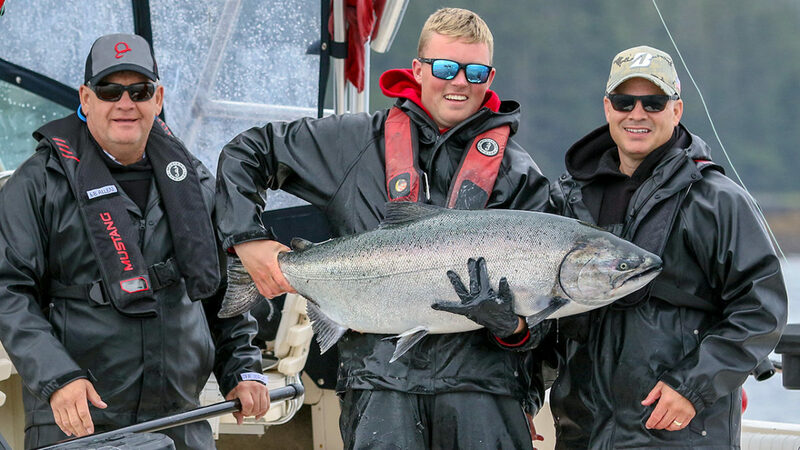 Gary V, fishing with his wife Janice and veteran QCL guide Nick Mercer, returned to the Bell Ringer with one of the season’s largest salmon, a stunning Tyee that tipped the scale at 45 pounds! 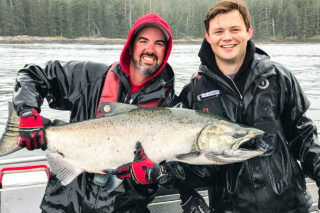 For a lot of first-timers, seeing some big salmon up close is pretty inspiring, hopeful that they will get a chance to tangle with one like that someday! When our guests chose to move offshore they found it pretty easy to “double-up”on their efforts. 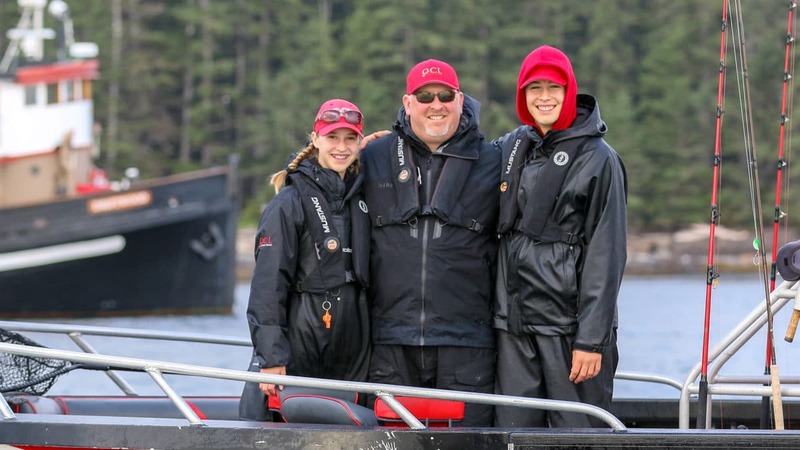 Halibut fishing has been a breeze lately, with many boats investing a whole 30-minutes to pick up a couple of nice “chickens”for the freezer. 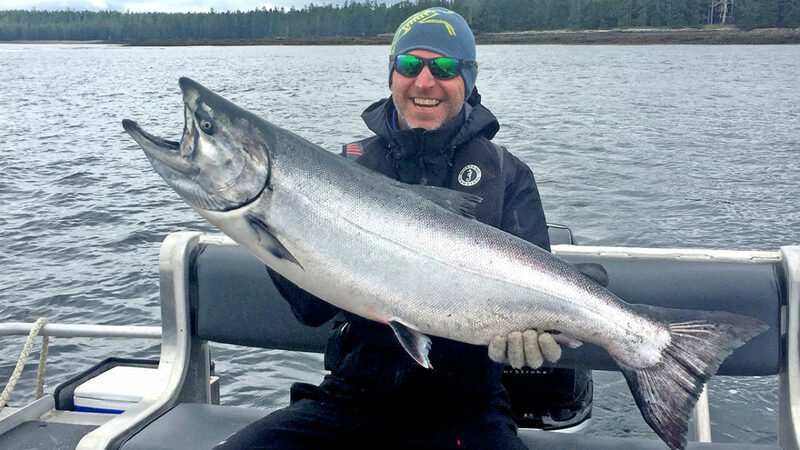 While they’re out there they spend more time trolling for Coho and they’re finding really nice fish. We’re seeing 12-13 pounders every day now and the occasional 14-15. The second half of August will be pretty exciting! 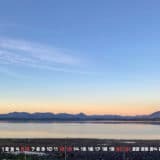 Never a bad day in Haida Gwaii, just some better than others. And while this will always remain true, it is a relative statement. The day and trip is what you make of it, just depends on what your mind set is. I am a firm believer that positive vibes yield positive results, what you define as positive is up to you. As a guide I have the privilege of meeting and experiencing different people and things, and every trip is different. For some, it is a couple celebrating their anniversary, wanting to experience all the sights and sounds of Virago Sound. 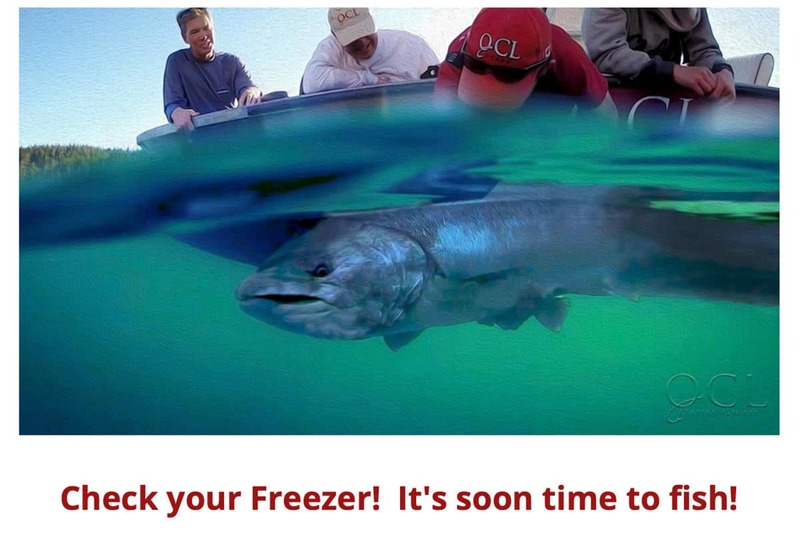 There is no need to necessarily target the sizzle of a large migratory Chinook salmon popping off the down rigger clip faster than you can you say “how you doing?” Often the thrill of seeing a large Orca hunting, maybe the dreary bark of a large bull sea lion, even the aggressive deep water dive of an auklet will leave the most experience outdoorsmen in awe. 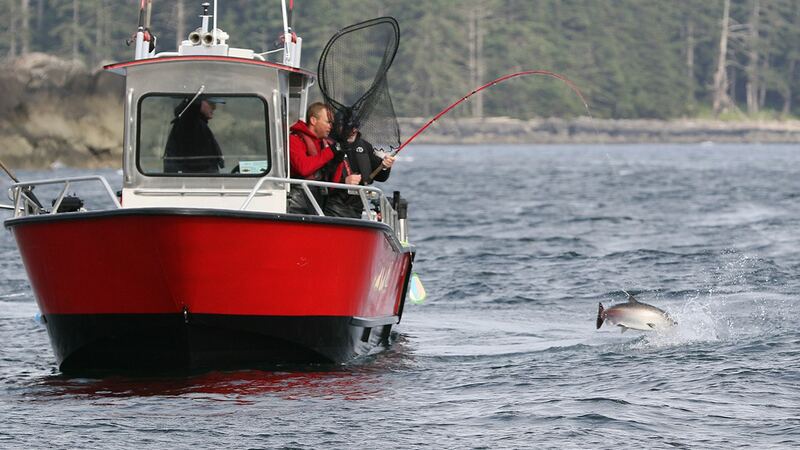 For some it is hooking the fish of a lifetime; for others it’s taking in the sights and sounds of Haida Gwaii. For most it is a balance of the two. 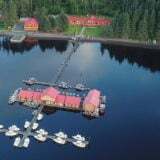 At the end of the day whatever your muse, our job is to give and do our best to provide our guests with as much colour as possible to paint on the canvas which is their trip to Queen Charlotte Lodge in Haida Gwaii. I look forward to painting further canvases in the future and trying to fulfill each guests dreams. 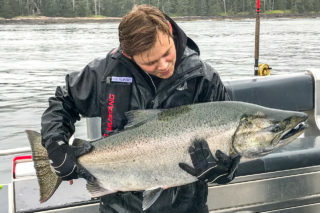 Northwesterly winds have definitely set the tone over this past week, directing the fishing effort to the sheltered shorelines south and east from Klashwun Point. Fortunately we’re finding some pretty nice Chinooks while combing along the kelp beds and rocky points. 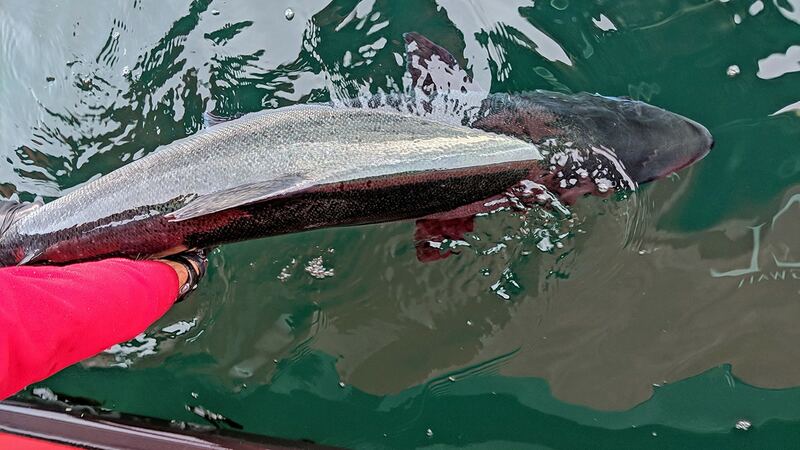 There have been opportunities to get offshore and pick up some Coho and Halibut as well, but some sizeable tide action can make that a challenge much of the time. The odd twist is that we usually enjoy a pile of big blue sky with these winds but that’s been pretty spotty most days too! 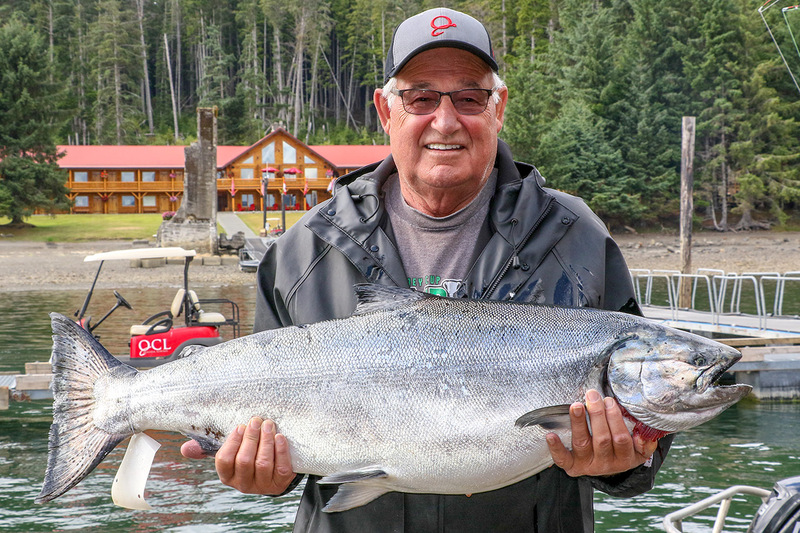 The Tyee bell was getting some action on most nights last week with several Chinooks and halibut tipping the scale over that magic 30 mark. 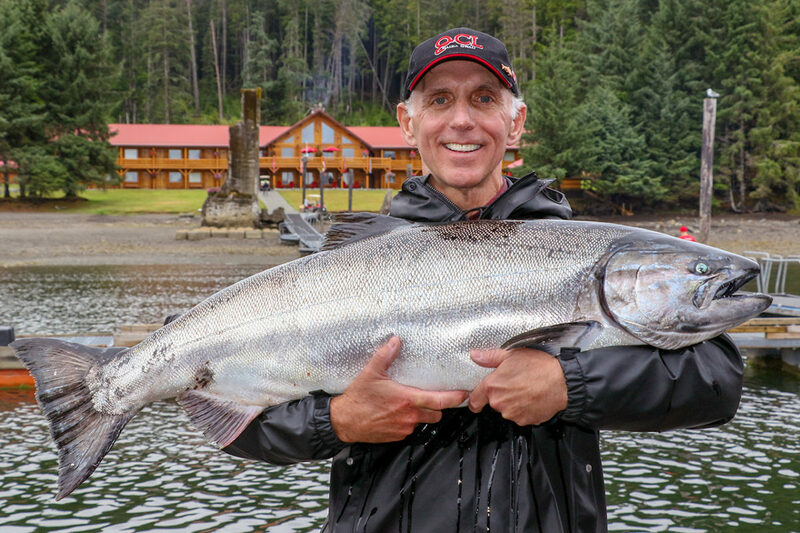 John R kicked the party off with a 30-pounder, repeating his Tyee Club appearance from last year. 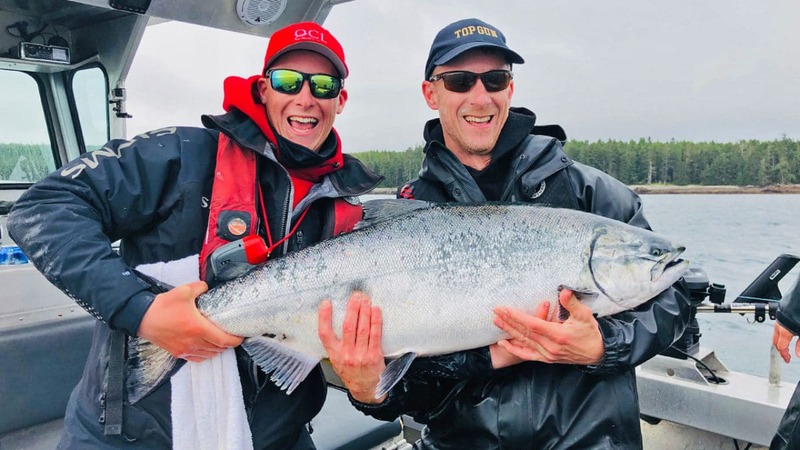 Brian K added a 30 on Wednesday along with Jordan C who boated a 32 and Laurence H who’s 37-pounder was the big salmon of the day. Matt C came close, however, with a 34 lb Tyee, but he seriously proved his skills with the 41 lb halibut that he weighed right after that! That’s a nice day on the water! 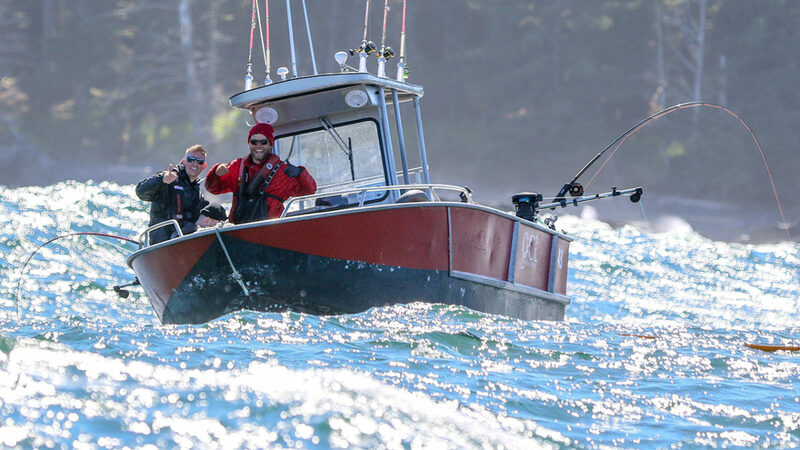 The winds let up nicely on Tuesday and the halibut fishers responded! We saw lots of flatties on the dock with several perfect specimens ranging from 30 to 42 pounds. Rob G missed the cutoff however with a big one that taped out to 86 pounds! Thursday proved fruitful for salmon hunters with more Tyee catches recorded. John P shared the thrill of the Tyee with his 2 sons, boating a stunning 31-pound Chinook. 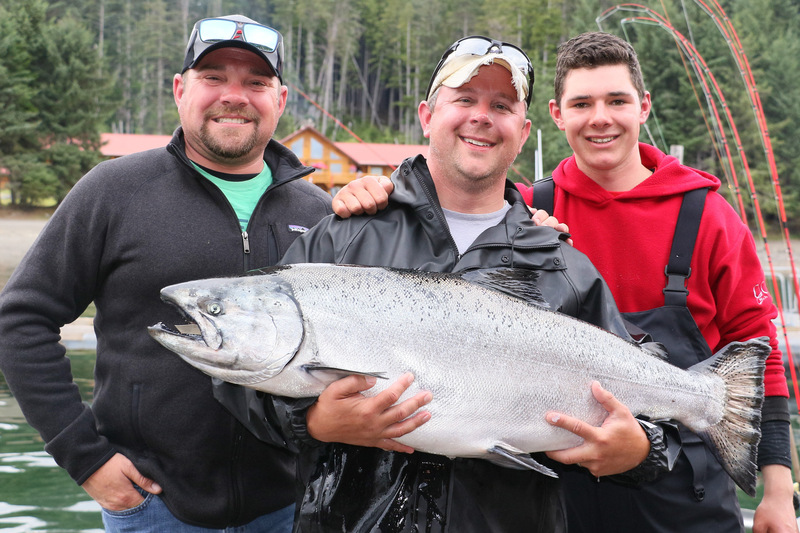 Makenna C got the day off to a great start at Bird 2 when she caught & released a beauty that taped out to 36 pounds! Fishing with his guide Trevor Harris, Clark H worked the shoreline religiously and was rewarded with two fine Tyee catches – at 31 and 33 pounds! 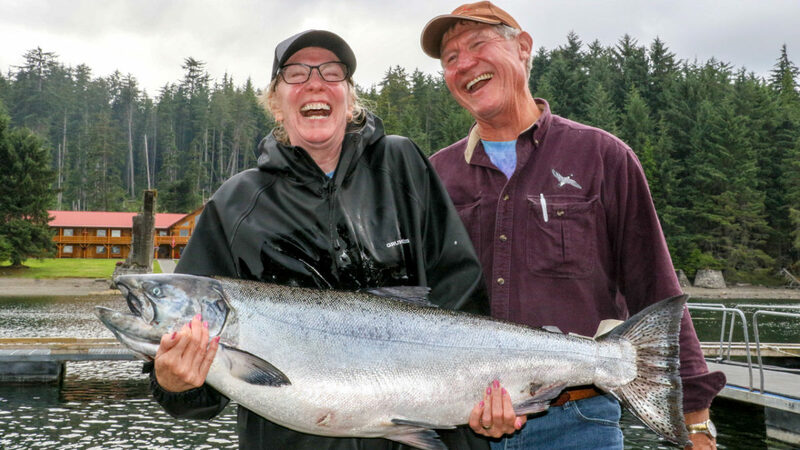 And off the outer face of Bird 2 at afternoon slack, veteran QCL anglers Carol H and her husband Andy connected with the big salmon of the week, a hefty Tyee that thrilled the Bell Ringer crowd at 42 pounds! The average size is creeping up steadily for both Chinook and Coho salmon over the past couple of weeks, and we’re really pleased to see so many chunky Coho in the 10-12 pound range! Let’s see what happens this week! 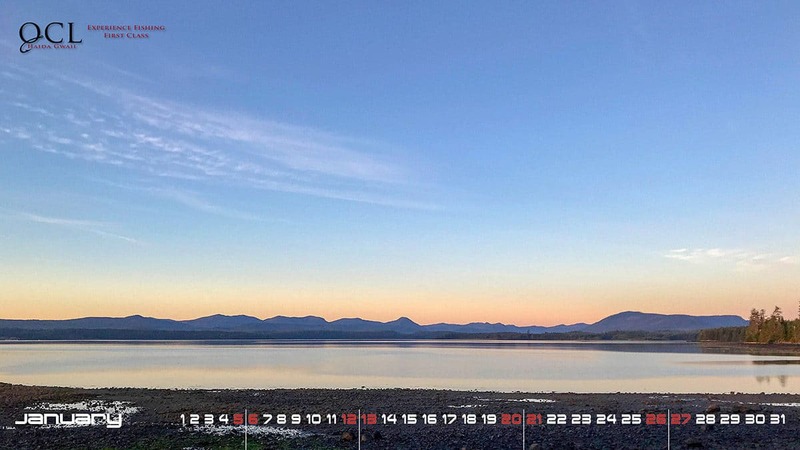 One of the coolest things about being a fishing guide in Haida Gwaii is the unknown of what each day will bring. 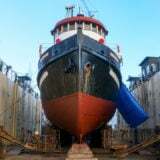 No two days are ever the same, as the sea conditions, weather, and fishing are always different. 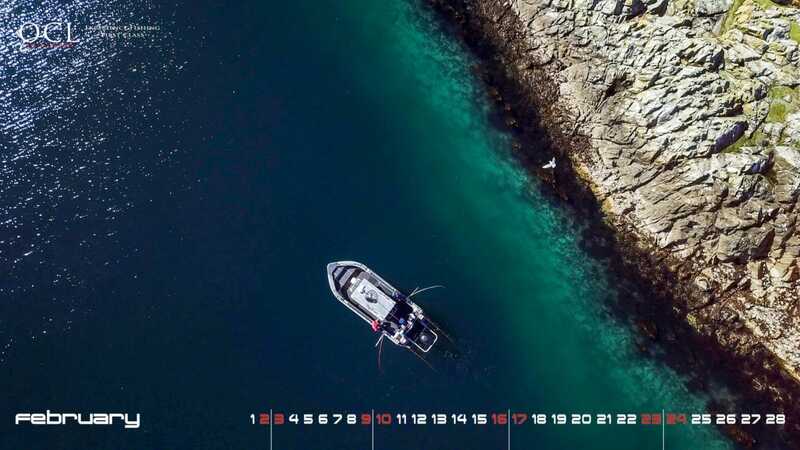 Although we like to plan our day out and try to predict what might happen on each tide change, our plans are often altered due to the various scenarios that take place on the water. Today was no different. With the first tide change not happening until around 10:30am, my longtime QCL guests John R. and Dan S. decided that we wouldn’t leave the dock until 8. My plan was to fish salmon a couple hours through the tide change, go out and grab a couple of Halibut, and then stop for lunch. The first part went according to plan; we set up shop for a couple of hours at Cape Naden with only 1 feeder spring to show for it that we ended up turning back. 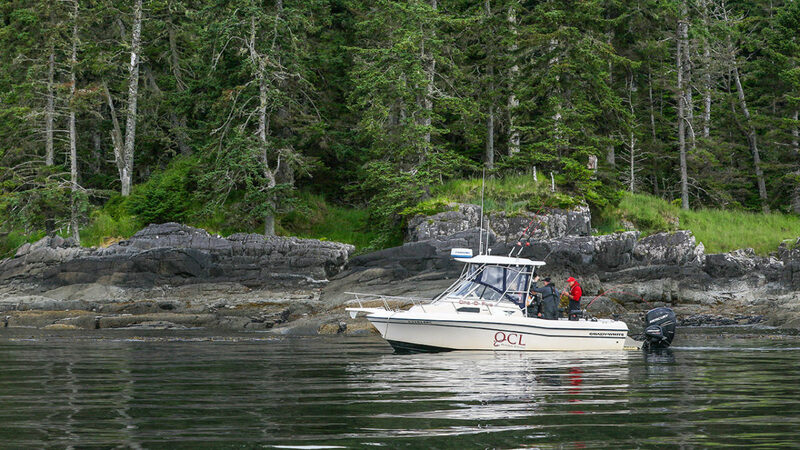 With not much happening through the slack tide I suggested we do one more pass and then run out for Halibut. On that pass we hooked another little feeder that popped off by the boat. A couple minutes after that I said, “Okay, let’s go grab some Hali’s”. Dan responded, “Come on, one more pass!” Sure enough, right near the end of that pass John had something pop the clip and then it was game on! 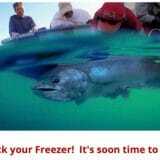 After a great battle we bagged a bright chrome Chinook that tipped the scales at 30.0 lb back at the Bell Ringer. Of course we weren’t going to leave now! Before we could even get a third line back in the water, John again has something smash his bait but it quickly popped off. Within a few seconds our back rod started sizzling line and this time Dan was tied into a beauty! 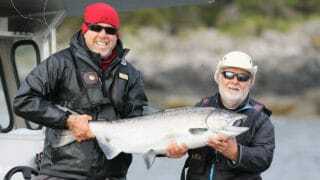 After an even longer fight than the first fish we put another one in the bag that weighed in at 26 lb. After a few more passes with no luck it was time for lunch at the DW. 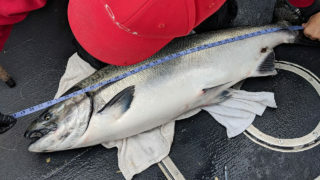 Although the afternoon was not quite as eventful, we grabbed a couple decent chickens, did some Coho fishing offshore, and then finished the day back at Naden. During our final couple hours we were greeted with some rain showers, followed by blue skies, and calm waters, followed by strong gusts of wind out of the west. In addition, the flood tide brought in waves and waves of kelp that made it nearly impossible to keep all lines in the water at once. Once again, on one of our “last passes”, Dan was into another dandy. 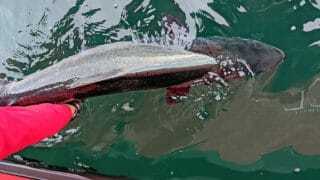 After a lengthy first run this fish managed to tangle the line into various large pieces of floating kelp. I thought numerous times that this fish was gone but today the fish gods were on our side. While I was steering the boat, John was able to use the gaff to unhook all the weeds from the line, which finally gave me an opportunity to slide the net under another beauty. 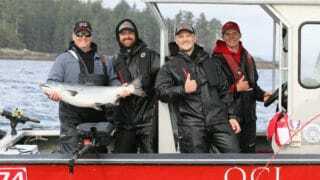 It was a great team effort and a great way to finish off another adventurous day in the Gwaii! Until next time, goodnight from Naden Harbour! Today was another sunny day on the fishing grounds with low to mid teen knot winds blowing from the northwest. In the morning the fleet of QCL boats either headed offshore to the 120-150 foot line searching for Coho and Chinook salmon or stayed close to shore, hitting the major points working the tide change searching for those larger Chinook lurking in the depths. The lighter morning winds allowed for calmer seas to hit the deeper depths for hali fishing as well. Grady 114 and its crew decided to start the day off by hitting Cape Naden, looking for a chance at a few larger Chinooks. This seemed to be a common thought as quite a few other boats came to join the party. After all was said and done we had a bright chrome 21 pound Spring hit the deck for the morning tide. 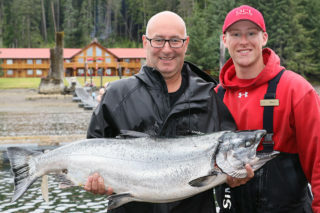 We were hoping for a couple more but with few hook ups seen or heard of, we gladly took what the fishing gods gave us! My guests and I rounded out the day with a tote of a couple of halibut, several nice Coho, another mid-teen Chinook and we let a few other feeders go to grow up! Not a bad day overall up here in this special part of the province. 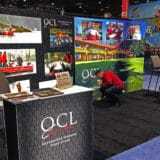 High fives, lots of laughs and positive energy at the Bell Ringer capped off another memorable day up here at QCL. Keep your tip up, line tight and hang on for the ride!